Here’s an image of a contraption. It is basically a long stick hinged at one end and is free to move about the other. At the end of it rests a ball. Near the ball there’s also a cup fastened to the stick. The big stick is lifted up high and is temporarily supported by a small stick. Now, what do you think would happen when the temporary support is removed? Normally, it would be very intuitive to think that the cup and the ball would fall at the same speed. In other words, nothing fascinating would happen. Both would fall and the ball would roll away…no? However, something very unexpected happens when the support is removed. Something that, in a jiffy demonstrates some very important concepts of physics like centre of mass, torque and acceleration. 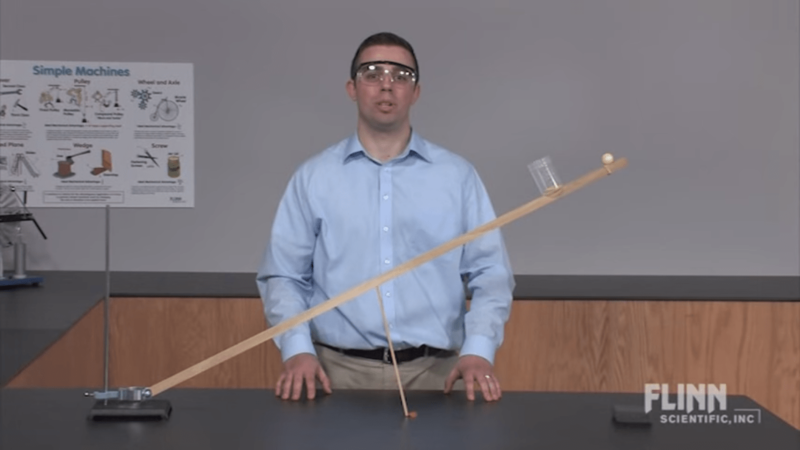 The big wooden stick (with the fastened cup) falls and it falls faster than the ball. Actually it falls and also rotates. As a result of the swing, the cup comes under the ball just before ball reaches it and the ball ends up inside it.